There's a new version of the Bentley Mulsanne that costs no less than $2.55 million. How come you've never heard about it? Well, the Carat 65 Bentley Mulsanne is an armored stretch limo built by Carat Security's "Carat Duchatelet" luxury division and it's for China only. That $2.55 million USD pricetag is converted from its more exact 15.8 million yuan listed price. Car News China covered this beast when it debuted at the Shanghai Auto Show a few weeks back, but the most of the car media world left the story alone because the Chinese car market makes no sense. 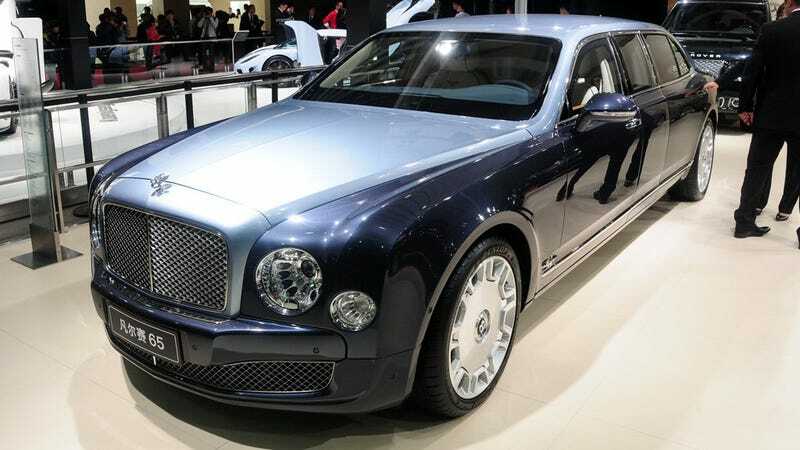 Of course, a standard Mulsanne will run you 9.28 million yuan in China, which converts to $1,507,935. If I was to walk into a Bentley dealership here in the states, I would need only $296,000 in my pocket to leave with a Mulsanne. Should China be pissed that the Carat 65 is so expensive? Not at all! For the money, the Carat 65 gets a 65 cm stretch in the wheelbase (total length goes up to 20 feet, five inches). That and the armor spec is B7, which can withstand an explosion of 15kg of TNT. That should be useful if things go sour while you're visiting your African mining operation. And it comes in two tone. Sweet.